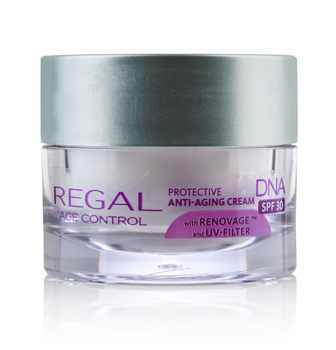 Provides a high degree of photo protection SPF 30 and counteracts the skin ageing processes. The RENOVAGE ™ molecule is a patented formula which facilitates telomere preservation and combats the stress the skin is exposed to. It smoothes wrinkles and fine lines. The blueberries extract - the most efficient natural antioxidant, revitalizes, improves elasticity and moisturises in depth. The product contains also wheat germ oil and collagen. THE RESULT: Protected from the sun, firmer, fresher, younger and full of energy skin. swimming and towelling. A decrease in the amount considerably lowers the level of protection. It does not guarantee 100 % protection.